Tank Details: All-Glass 72gal. bowfront (48 x 18 x 22). 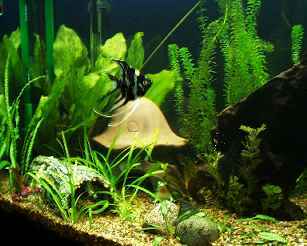 The Fish: 2 marble angelfish, 3 black lace angelfish, 1 male betta, 9 neons, 4 clown loaches, 5 ottos, 1 lg. pleco and 3 algae-eating shrimp. Comments: On the right side of the tank is a grotto formed from 3 rocks piled together with a 4th flat stone leaning up against the back of it. This forms a perfect cave for my ottos & clowns. I like the look of the moss growing on the top of it. On the left side of the tank is a fake hollow log which is home to my 9" pleco, Lucifer. He is almost as long as the log. Behind that is a toad house for my clowns, but they now prefer the grotto. 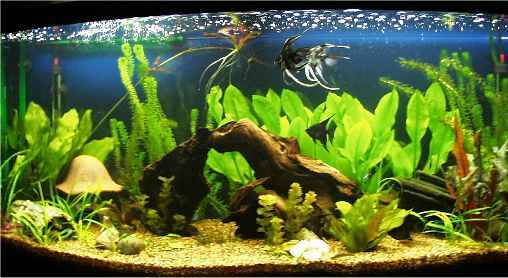 In the middle of the tank are 2 pcs. of bogwood leaning together to form an arch. The rt side piece has a neat tunnel at the bottom of it that Lucifer just loves.